GOODBYE TO A STANDUP BROTHER : Since his sudden and untimely death on June 13, it's been said that no newsman would have enjoyed Campaign 2008, and its historic climax, more than Tim Russert. Gwen Ifill's smart and surprisingly emotional reflection, "Goodbye to a Stand-Up Brother," on the death of NBC's Washington bureau chief is also a historically useful take on the man, providing insights that many other outlets missed during the spate of coverage after his death. Ifill offers testimony to Russert's open-mindedness and mentorship at a time when few women—much less black ones—were upwardly mobile in news media. And her description of the man who loved to "drop by my house, grab the first baby who wandered by in a house full of mostly black people, and work the room like he never wanted to leave" is revealing and endearing at once. 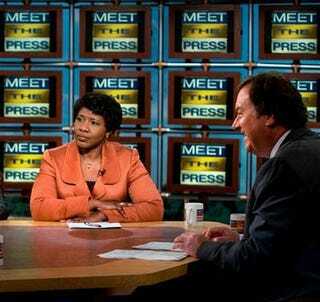 Though Ifill will not step into Russert's shoes at Meet the Press, her intimate look does much to preserve a prominent journalist in our collective memory. SKETCHY IMAGERY : When I picked up my advance copy of the July 21 issue of The New Yorker, I knew instantly that the Barry Blitt cover cartoon—recreating the now infamous "terrorist fist jab" between a militant Michelle and djellaba-ed Barack Obama—would kick up a storm. Though it spawned cries of racism, and canceled subscriptions, and even some (temporary) beef between Team Obama and the magazine, it also offered the opportunity to take a look at how the president-elect had been drawn over the course of the campaign. The answer: not well. Between his skin tone, thin chin, big ears and unique smile, cartoonists struggled to find an accurate caricature of Barack. And, nearly six months later, I'm afraid many artists still get the first family wrong—and at least some of it has to do with race. As Slate's Julia Turner recently wrote of the fashion designs submitted in hopes of dressing Michelle on inauguration night: "These sketches suggest a discomfort with blackness that's truly startling." So it's back to the drawing board—literally. Dayo Olopade is a regular contributor to The Root.